BabyPips.com just bagged the Best New Contributor award in FXStreet.com’s Best Forex Awards for 2012. Yipee! It’s time to celebrate! But before I paint the town red with my fellow FX-men, let’s take a look at what’s been moving the markets lately, shall we? As Forex Gump discussed thoroughly in his article about China’s sprint slowing down to a jog, the Asian giant downgraded its 2012 GDP forecast from 8.0% to just 7.5%. If you’re thinking that 7.5% isn’t exactly a bad figure, you should know that it’s equivalent to China’s weakest GDP growth which was last seen in 2004! During the RBA’s latest monetary policy decision, Governor Glenn Stevens announced that they would consider rate cuts should demand weaken in Australia. They also highlighted the persistent risks from the euro zone debt situation and the expected slowdown in China as potential reasons for further easing. Greek bond swap concerns to keep risk-taking in check? It seems that there’s still plenty of uncertainty surrounding the outcome of the ISDA meetings which will decide the fate of Greece’s bond swaps. Bear in mind that Greece needs two-thirds of the panel to give a thumbs-up, otherwise the odds are tilted towards a credit default. Alright, it’s time to zoom in on how the comdolls have been performing this week! The comdoll gang is all in the red this week as risk aversion, combined with several negative factors such as the downward revision on China’s growth forecasts, weighed on these higher-yielding currencies. If you’ve marked your weekly ATRs, you’d have noticed that both AUD/USD and NZD/USD already broke below their respective bottom WATRs while USD/CAD already surged past parity and its top WATR. Do you guys think that the commodity currencies are set to continue their slides for the rest of the week? Or is a midweek reversal likely? As always, you know where to reach me! 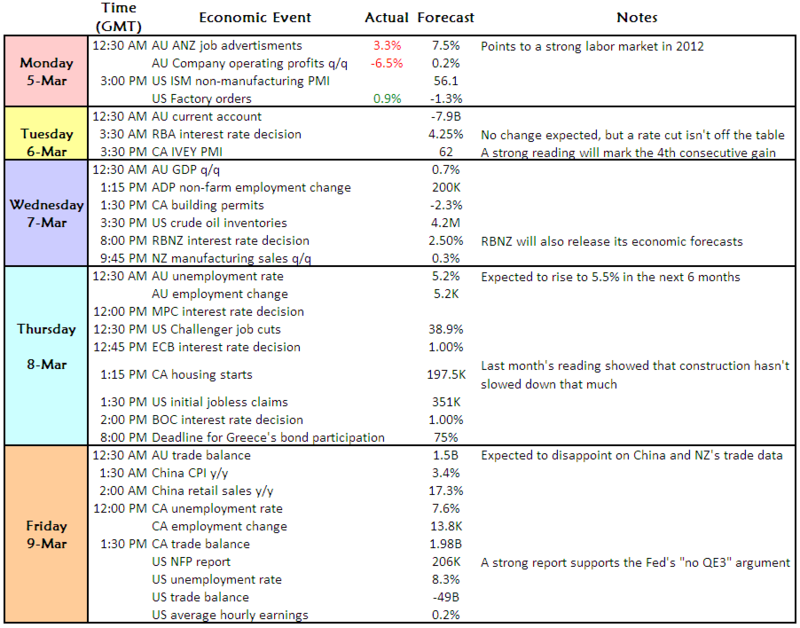 The NFP week usually presents us with tons of economic reports and this week sure doesn’t disappoint expectations! We started the week with a warm-up of sorts with the ANZ job ads and visitor arrivals reports from Australia and New Zealand. But hold on to your seats because we’re in for more action for the rest of the week! The RBA, RBNZ, ECB, and the BOE will all release their interest rate decisions this week, while Australia, Canada, and the U.S. are also scheduled to publish their trade balance figures. If that’s not enough to get you excited, then I should probably tell you that the Canada, Australia, and the U.S. will also show their employment numbers… on the same day!